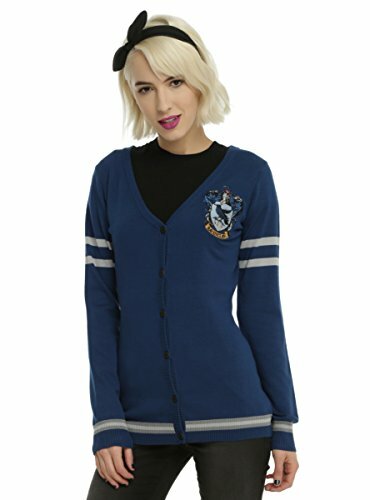 Harry Potter Ravenclaw Girls Cardigan | What Should I Say? "Wit beyond measure is man's greatest treasure." - Rowena Ravenclaw As you're walking through the halls at school, pretend you're a student at Hogwarts while wearing this cardigan from Harry Potter . It's dark blue with an embroidered Ravenclaw house crest, grey stripes and front botton-up closure. Intelligence, wit and creativity... yeah, you belong in Ravenclaw. Click here for plus sizes. If you have any questions about this product by BW, contact us by completing and submitting the form below. If you are looking for a specif part number, please include it with your message.